Looking for an inexpensive way to spend a beautiful fall day without venturing far from home? Do I have a suggestion for you! Six suggestions, actually. A few days ago, a friend and I set out before dawn in search of adventure that didn’t include big crowds or a whole lot of driving. We travelled through heavy fog to Celina, where we enjoyed a robust breakfast of western omelets and piping hot coffee at the Gone Country Café, located just across the street from the Clay County Courthouse. Our next stop was the Vernon Community in Hestand, Kentucky. Founded in 1996, it’s a “para-Amish” horse-and-buggy community that follows the traditions of plain dress and simple living. Friend and I arrived as the children—boys in suspendered britches and girls in bonnets and long dresses—were making their way to school. We bought sweet potatoes, bell peppers and warm-out-of-the-skillet fried pies at the country store and gratefully accepted the offer of a buggy ride down a dirt road behind a pony-mule named J.D. Then it was on to Tompkinsville, where we spent half an hour shopping at Bruton’s Hardware and Furniture Store, gaping in amazement at the thousands of items—from nuts and bolts to sofas and chairs to appliances to farm equipment–for sale. We didn’t buy a thing but we sure had fun. For me, the highlight of the day was a ride on the Cumberland River Ferry, Kentucky’s only 24/7 state-owned and operated ferry. 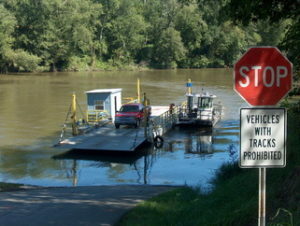 Located in Monroe County at McMillan’s Landing, once considered one of the finest steamboat landings along the upper Cumberland River, it connects two segments of Kentucky Highway 214 and is the only means of crossing the river in that area for more than 30 miles. The trip is free and typically takes only a couple of minutes. But those couple of minutes are absolutely lovely. Our last stop was historic Granville, where we strolled among 300 life-size scarecrows and historical characters while enjoying 1940s swing music broadcast up and down the main street. The Scarecrow Walk runs through October 28 and is open Wednesday through Friday from noon until 3:00p.m. and Saturday from noon until 5:00. And there you have it—plenty of ways to get out and enjoy autumn right in our own backyard. Go for it. Because winter will be here before you know it.